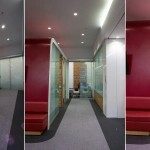 Switchable Privacy Glass provides a wide variety of privacy solutions for commercial offices and banks. We manufactured a number of Switchable Privacy Glass panels in exciting shapes and linear curves for Bendigo Bank in Adelaide’s downtown Rundle Mall. This Privacy Glass solution created an environment that enhances both staff and customer experiences, while offering security and privacy at the flick of a switch. The architect responsible for the design of the interior renovation of this iconic South Australian bank chose Switchable Privacy Glass, and the project won him the People’s Choice BDAV Building Design Award.